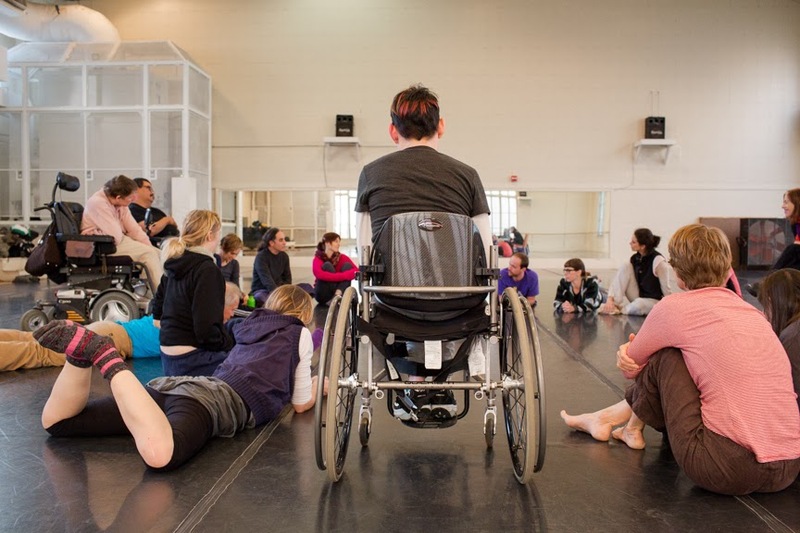 In December of 2013 Forklift Danceworks, in collaboration with VSA Texas, hosted a weekend long intensive with Alito Alessi through our mixed-ability dance program, Body Shift. Who better to engage with movers of different abilities, backgrounds, and experience than one of the founders of a technique based in inclusivity and equality for all movers! Alito Alessi currently serves as the artistic director of DanceAbility International, an organization that is designed to “encourage the evolution of mixed-abilities dance by cultivating a common ground for creative expression for all people”. 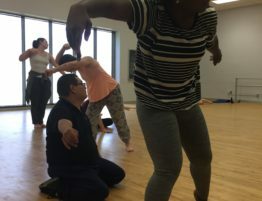 After cultivating his dance method (known simply as DanceAbility) for 25 years, he has established himself as an expert in mixed-ability movement and improvisation. Whether it be in the studio or on the stage, Alessi strives to empower movers to explore their own creativity and self-expression and to communicate with each other through movement. To get an idea of what it was like to work with Alito I interviewed two dancers of different abilities that participated in the workshop in order to get two different perspectives. The first is Lucy Kerr, a philosophy and dance double major at the University of Texas. How much experience do you have with mixed-ability improvisation? I have a background in improvisational dance, but didn’t take mixed-ability improvisation classes until a little over a year ago. My first class was a Body Shift class taught by Allison Orr. It was similar to many other improv classes but the participants were far more diverse. I have been very active with Body Shift ever since, and have attended almost every Body Shift class and the three performance workshops. I have an interest in mixed-ability dance and in directing mixed-ability productions of my own. 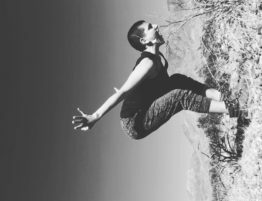 I have created my own mixed-ability dance works utilizing mixed-ability dance improvisation and choreography, blending what I have learned in Body Shift with my own dance background, dance practices, and dance philosophies. What got you interested in this workshop? I am most interested in performance and dance for social change, and I have a strong interested in mixed-ability dance because of its advocacy for inclusion and disability awareness. Through this kind of dance we can advocate that all people can move in compelling ways and that disability does not necessarily mean limited or deviant. Dance also does not necessarily mean “perfection of the human form” nor is it reserved for only the most athletic and able-bodied people. Body Shift has given me the opportunity to be part of a diverse community, something that other dance institutions do not provide. It allows me to meet diverse artists, and to work, dance, and collaborate with them. I was very excited to take Alito’s teacher orientation because it taught me how to teach improvisation to all kinds of people in the classroom, which is different from what I usually do, which is either choreograph or participate as a dancer in workshops. I hope to be able to teach mixed-ability improvisation classes in the future. Is this your first time participating in Body Shift classes? (See above) I started participating over a year ago and have been dancing with Body Shift since then. How did Alito Alessi and DanceAbility shape your personal creative process? Alito opened my eyes to even more possibility with improvisational dance. I am always very interested in finding new and unexpected possibilities in performance and with unexpected people. Alito shared with us how to include more people in performance work and gave us more methods by which to investigate the amazing possibilities of every dancer. In the teacher orientation we discussed possible students in the classroom with specific disabilities. It was very interesting to hear what kinds of things are possible with different people and how we may discover and celebrate these possibilities in dance work. Do you believe that interacting with other bodies in space creates a sense of community and equality? And do you feel that you were able to understand and connect to your fellow movers by communicating through movement? Yes, being with other people in space and interacting with them through movement creates a sense of community for me, and that is one of the reasons I keep coming back to Body Shift. I also think that through this kind of dance movement, in which each person is respected for his or her creative choices and movement possibilities, ideas of the “norm” are dissolved and everyone is recognized as an artist in their own right. This is very refreshing for me as a dance artist with a background in ballet and technical modern and contemporary dance. In the strict spaces of modern and ballet, dancers are trying meet a specific standard of technique and artistry. I enjoy modern and ballet but this kind of system can be exhausting for students. Body Shift and DanceAbility do not enforce a technical standard and exclude no one, such that everyone is celebrated for their unique movements. This creates equality and a more just dance environment. 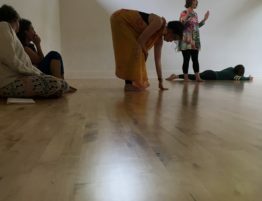 When actually participating in Body Shift, I feel that I can connect with people very different from myself through a shared love for movement and improvisation. 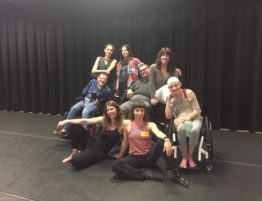 I have done a lot of research on disability studies and disability in contemporary performance, but the experience I’ve had with the diverse group in Body Shift has taught me more about disability then all of my research could have. When one has just a simple physical interaction with a person of a different body-type in Body Shift, it changes you because these kinds of interactions do not happen in the every day and the public sphere, where we are usually segregated based on ability. This breaking down of barriers is very exciting for me. What was the most enjoyable part of the process? What was the most difficult? The most enjoyable part was learning about how to instruct certain groups of people based on who is in the group. This involved strategies about how to include everyone while also challenging everyone’s dance practices. We then participated in these exercises in the teacher orientation, which was fun getting to see how the exercises worked. I really enjoyed then going into the workshop and observing who was in the workshop and how Alito implemented the exercises based on who was in the group and how to include everyone and also to challenge everyone. This process was very informative for me and I learned a lot this way. The most difficult part was taking in all the information in such a short time, and improvising for long periods of time. That was exhausting but I improved a lot and learned a lot from the crash course. If you could take away one thing from this experience, what would it be? I am still thinking about Alito’s methods regarding how to include everyone and how to not exclude anyone. A strategy involves working in duets if there is at least one person who is immobile: if one person needs to be in a duet, then everyone gets in a duet. This does not make it easier on all of the other people besides the immobile individual but instead challenges everyone in new ways while making sure no one is isolated or hypervisible because of their disability. I am still thinking about this for my own dance work as well as investigating how this theory can be implemented into the every day world. How can we make sure that people are not isolated or excluded in the public sphere because of their disability or uniqueness, and how can we also make sure that it doesn’t create an imbalance? I often think that if we implement Alito’s methods into the public sphere a more just society can be created. The second dancer that I interviewed was Susie Angel, a research and editing specialist for the Coalition of Texans with Disabilities. Susie has cerebral palsy and uses a wheelchair to travel long distances. My experience with mixed-ability improv started with Allison when she choreographed a dance during a theatrical piece that I did through VSA in May of 2008. I can’t remember if VSA and Forklift started doing Body Shift workshops that summer or the following summer, but whenever it was, I was in on it from the beginning and I have only missed a handful of workshops ever since. In 2011, I also started working with a student from UT, Lucy Kerr, who was working on a mixed-ability piece for her thesis. The piece is called “The Way You Move Your Body” and the group is made up of students from UT and a couple other veteran dancers with disabilities from Body Shift. 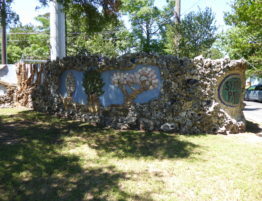 The group bonded together the more we worked together. After we presented for her thesis, most of us decided to keep working with Lucy to create an extended version of the same piece to perform at UT’s 2013 Cohen New Works Festival and, again later, at an AccessU annual convention. After those, we decided to stay together and create our own dance company, The Other Dance Company. We just completed a new piece for this year’s Frontera Fest and are also planning other projects for later this year. Mixed-ability dance has really helped me fulfill the dream of being a dancer that I had until I was 12 years old. Society convinced me that I couldn’t be a dancer because I couldn’t walk. 26 years later, Allison and VSA helped me prove everyone wrong. 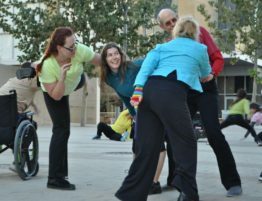 I was excited when Body Shift started doing site-specific performances around Austin. I knew that, no matter what, I wanted to go to the workshop because I always go, but I got even more excited when I found out that Alito Alessi would be our guest instructor. My friend, Tanya, had gone to take his full teacher training orientation in Brazil about 2 years ago and when she came back she was so excited to tell us everything she had learned. That’s why I was interested to see what he had to teach us. No, I have been taking Body Shift classes since 2008. I continue to work with Body Shift because it has given me the confidence to do other mixed-ability dance projects within the community, like what I am doing with Lucy. I’ve been doing a lot with Body Shift over the years, but we have really only been working with the same people the whole time and most of them have been people with physical disabilities. Although we have worked a little with a couple people with autism, that was about the extent of our interaction with people with cognitive disabilities. When they would come to dance with us, I didn’t feel like they were part of the group because they were only observing and not dancing with us. However, when Alito came and started talking to us, he made me realize that a mixed-ability group wasn’t really a mixed-ability group until all different types of people are in it. He told us that it was ok to let anyone watch. For example, people who have a cognitive disability or people who are shy or uncomfortable, often like to watch. We shouldn’t feel the need to pull them in and make them dance if they don’t want to because they are still in the space with us. We should just let them do whatever they feel comfortable doing because because they may be just taking it all in. So, you can’t really evaluate inactivity from someone as a failure because you never know what is going through their head. For me, that was really important to understand. Now, I understand that everyone’s process is different. Yes, I think it creates a sense of community and equality but only if you know the right way to interact with people. For example, we have a woman in our group who is non-verbal and can’t control her wheelchair. For her to move, she needs somebody to move her. In the past people have been going up to her and just moving her chair. But when we took Alito’s class, he taught us how to interact with her. He said that before we start to move her, we should be going in front of her, making eye contact, and allowing her to make whatever movement that she can make in order for her to give us permission to move her. And then even when you are moving her, you should always keep some kind of physical contact with her body instead of the wheelchair. This is because if you’re just pushing the wheelchair, then you are only interacting with the chair and not her. You have to get creative about how you move with people in order to make it equal. I feel like I was better able to connect with fellow dancers because of what he taught us. The most difficult part was working for three straight hours, but he had to do it because he was trying to get so much information into one week. Although it was understandable, it was still very difficult after working all day before going to the training. The most enjoyable part was getting the opportunity to play with and practice everything he taught us. He had to do a lot of necessary talking in order to train us, but I looked forward to the moment when we got to experiment in the space. There was one exercise we did where we were put into groups of three and our instructions were that one of us had to take the lead and get the other two to follow and stay engaged by only using hand signals. When it was my turn to take the lead, Lucy was in my group and she pretended to resist me so I had to do whatever I could to try to draw her back in while staying engaged with the other person in the group. It was interesting because I don’t know if someone else would have done that for me. I think because I’ve known Lucy and worked with her for a while that she knew how best to challenge me. It was good for me to have that experience because it stressed to me that I will have to be prepared for anything if I want to conduct mixed-ability workshops. It was probably one of the most eye opening exercises for me and I enjoyed the challenge. We only got a taste of what Alito has to teach and I can’t wait to have the opportunity to learn even more from him. He really taught us to open our minds to how to connect with people and I guess that was the most important lesson I took away from my time with him. At one point during the weekend workshop, we had someone with a cognitive disability come in. She didn’t really want to be in the group and walked out of the room. Alito told us that when that happens, one of us would go out and help her by trying to engage with her in any way we could. When one of the dancers went outside and spent some time connecting with her by going up and down a stairwell at different speeds. She never felt comfortable enough to join the rest of us, but she did make a connection with one of us. You can’t make the stage equal for everybody unless you know different ways to make that happen. I feel like I have some of the tools necessary now in order to do that. After interviewing these two dancers and learning a little bit about Alito’s process, I can’t help but admire his attention to every body in the space. He creates a supportive environment in which all movers can feel free to examine their own creative process. With this safety net, dancers interact and see each other on an equal plane, regardless of ability. To see and to touch, to investigate not only society’s misconceptions and prejudices, but perhaps your own as well. It is certainly an eye-opening experience. Yet, there is nothing like connecting through movement and discovering something together, seeing what you can find in the moment. That is what is so beautiful about Alito’s use of improvisation… that moment we share, is just a moment. It does not last. But what we found in that moment and the connection we made, that is what remains.